Find out what the “Slow Stitch” movement is all about. 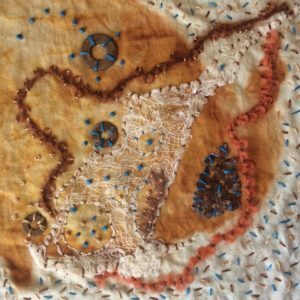 In this workshop combine embroidery, weathered bits of metal and rusted fabric to create a one of a kind textile collage. Learn 4 basic embroidery stitches (running, back, seed and the French knot) that will be used as decorative elements and also to attach a variety of items including metal washers, nails, stained cheesecloth, fabric strips, yarn and buttons to pre-rusted fabric. The shape, color and texture of these items as well as the pattern on the fabric will help guide you in the freestyle composition of your collage. Each participant will receive an 8” square of pre rusted fabric, a 6” wood embroidery hoop and 2 embroidery needles. Instructions for making your own rusted fabric will be provided . All supplies are included but feel free to bring any small lightweight rusty metal bits and/or embroidery floss you may want to use in your work. Suitable for all levels, beginners and experienced alike. No previous embroidery experience is needed. Teaching artist Kathy Johnson has a passion for anything paper or garden related and works in the mediums of collage, mixed media and eco printing. She has had fun creating many different origami models over the years and finds the modular form such as this wreath to be a very relaxing and meditative process.